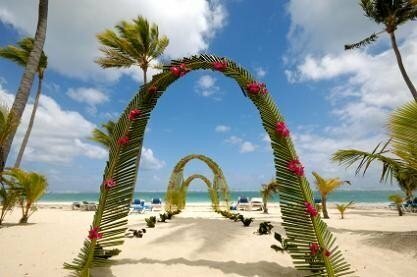 Transport your guests to a fabulous luau with Hawaiian wedding decorations. 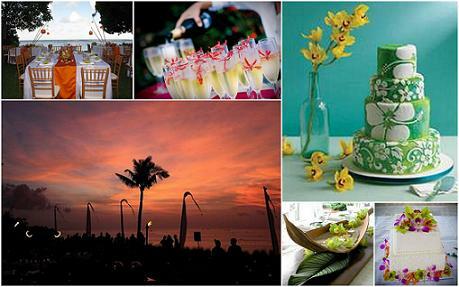 It's no wonder Hawaii is a top destination for couples to celebrate their big day. Even if you can travel to Hawaii there are ways to bring a little bit of that island flavor into the mix. It's easy to create Hawaiian wedding decorations, the hardest part will be deciding which elements to use, because the choices are almost endless. The flowers of Hawaii are fantastic and colorful. There are hibiscus in a rainbow of colors, and Plumeria or Birds of Paradise make fabulous flower choices as well. Choosing your wedding flowers is always a great place to start, when decorating for your wedding. Bridesmaids can carry a single stem of Ginger Flower. Not only will it make a dramatic statement, the gorgeous and elegant flowers are fairly inexpensive, especially compared with the cost of a large bouquet. Antherium flowers make a great addition to wedding centerpieces, and aisle decorations. These waxy flowers look more like fancy leaves than anything, and they come in cool tropical colors like chartreuse, pink, red and ivory. Add lots of thai leaves or palm fronds to make your arrangements fuller and to add contrast. Even if you've never been to Hawaii you can pull off these Hawaiian wedding decorations. The flowers of Hawaii are fantastic and colorful. There are hibiscus in a rainbow of colors, and Plumeria or Birds of Paradise make fabulous flower choices as well. Choosing your wedding flowers is always a great place to start, when decorating for your wedding. Bridesmaids can carry a single stem of Ginger Flower. Not only will it make a dramatic statement, the gorgeous and elegant flowers are fairly inexpensive, especially compared with the cost of a large bouquet. Antherium flowers make a great addition to wedding centerpieces, and aisle decorations. These waxy flowers look more like fancy leaves than anything, and they come in cool tropical colors like chartreuse, pink, red and ivory. Add lots of thai leaves or palm fronds to make your arrangements fuller and to add contrast. Even if you've never been to Hawaii you can pull off this Hawaiian wedding theme. Make a clear path to your ceremony or reception site, especially if guests are walking through the sand Line the outside aisles and walk ways with tiki torches and the inner aisles with a line of fresh orchids or hibiscus. Place a whole pineapple next to each chair in the aisle, and surround it at it's base with stargazerlilies, antherium, orchids and palm fronds. Another great way to line the aisle for your Hawaiian wedding, would be to use a combination of seashells and flowers. Larger shells are best and they make decorating a longer aisle easier and less expensive. Flowers like Peruvian lilies give you an inexpensive way to create an island look. Tiki Torches are a must for creating a tropical atmosphere for your hawaiian wedding decorations. If you are planning an evening event, lit torches look amazing. For a daytime wedding the the tiki torch can be used as a flower arrangement holder. Simply remove the fuel holder and put a foam block in it's place, add tropical flowers like orchids or Antherium an viola! You can use leis or leafy garland to drape between the torches to create an isle, section off areas, or create your pathway. Most party and home improvement carry tiki torches, and they are pretty inexpensive. Tropical plants or trees look great at the head of the aisle and can also be used along the path leading to your ceremony site. Small palms like rubellini with it's feathery fronds, and sago palms with a more structured, deep green frond, work extremely well.